The idea for this recipe came about during my last trip stateside. We were browsing in the Ballast Point home brew shop in San Diego when I spotted these little bottles of concentrated flavour extracts. They're supposed to be used a bit like Soda Stream concentrates but you can also make alcoholic drinks with them. 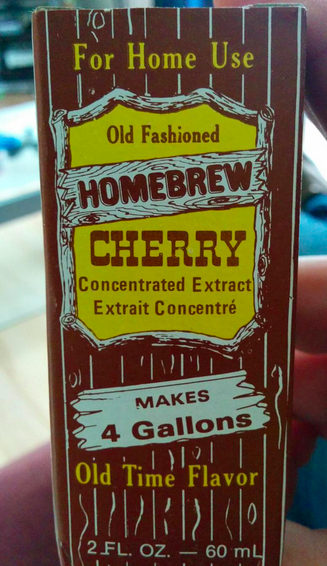 I grabbed a few - Cherry, Root Beer and Cola - with designs on making separate Cherry Cola and Root Beer brews, incorporating those bold flavours into sweet, dark beers. An opportunity to brew the former arose when friend, fellow home brewer and jolly nice chap Andrew Hobbs came to stay over on the weekend of the Siren Maiden launch party. We'd decided on brewing something together on the Sunday morning and having put this idea to Andrew in advance, we exchanged a few thoughts on it and settled on a recipe. The aim was to brew something big but sweet - it needed to be part of the overall makeup of the finished beer but not overpower the cherry and cola flavours. 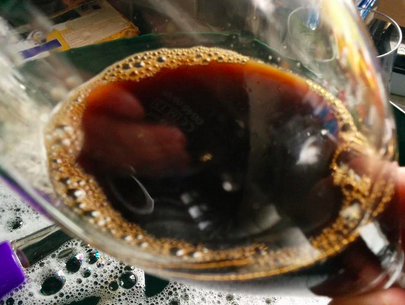 A lactose-laden milk stout seemed an obvious way to go so a grist was designed around that with the aim of keeping the colour on the very dark brown rather than black side to reflect the colour of cola. Brown and lactose sugars were added towards the end of the boil, bringing the OG up to a respectable 1.098. We wanted to keep the FG on the high side and the generous lactose addition helped achieve a final gravity of 1.030, making this around 8.9% ABV. The beer before flavouring tasted nice and sweet as intended, with just a subtle hint of roast and chocolate flavours. The colour was also pleasingly cola-like. The photo here shows the beer once the flavourings were dosed in and the cherry one has contributed a slightly reddish-brown hue. The finished article has the almost almond-like aroma of the real thing with the flavours being cherry up front before the cola and lactose sweetness washes through, all against a backdrop of subdued roasted malt and chocolate - a decent outcome overall and a brew that's dangerously drinkable for something with such a high ABV. It was fun collaborating with a fellow home brewer, exchanging ideas and techniques and of course sampling a few previous brews along the way. Andrew also brought along the most vital of brew day ingredients - fabulous smoked bacon he'd picked up from Borough Market. He's welcome back anytime!